Dec-2015 Joshua Oigara tweeted this about Patrick Njoroge , the Central Bank Governor: "@alykhansatchu @KCBGroup I salute the governor @njorogep he is no-longer "new". An exponential pragmatist and a masterstroke fellow." Department released Monday. It was the first time that the U.S.
global hedge funds hub," according to the report. Lebanese premier Rafiq Hariri described him as an “untraceable ghost”. Hezbollah have achieved a kind of parity with Israel. No-One else has. CanadianPM Prime Minister Trudeau discussed pluralism, human rights and respect for diversity with His Highness the #AgaKhan. 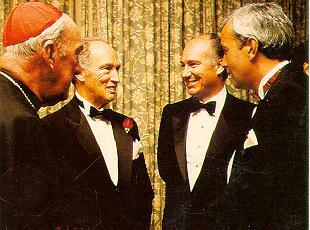 Aga Khan with former Prime Minister Pierre Elliot Trudeau. been projected onto the walls of the country's embassy in Berlin. was about 30 percent below the 100-day average. two of the largest producing countries. holding a bearish position since the week ended Aug. 25.
touched $1,686 a metric ton on Monday, the highest since August. November, when he is supposed to step down. the country to well beyond the elections date. biased towards Kabila, and so is Dlamini-Zuma. South African President Jacob Zuma”. the agenda of the AU summit in Rwanda in July. I think President Kabila is going to find it very difficult to hold on. staff in the prime minister’s office. natural resources like oil and gold to generate most of its revenue. principal economic adviser, said in the capital, Kinshasa. issued Eurobonds in recent years, according to Ngonga. long-term viability of Congo’s macroeconomic framework, Ngonga said. $280 million is immediately available to the bank. likely to come from the World Bank and the AfDB, according to Ngonga. Angolan author jose' Eduardo Agualusa poses with his book A General Theory of Oblivion in London, May 15.
for the Man Booker International Prize. has to burn her tomes for firewood—onto the walls of her apartment. beyond what she can imagine. chaired by Mandera Senator Billow Kerrow. look like a kids’ game. interest by shareholders and directors. Sh10 billion as the first step to reviving the lender. have shown little interest in reopening the lender. been complicit in the collapse of the three lenders. banks collapsed yet we had a supervision team,” he said. The Nairobi All Share rebounded +0.43 points to close at 145.74. Low to close at 3878.42. Equity Turnover improved to clock 636.713m. properly looked through the recent Noise. supported and the Rights Issue will be fully taken up. declined 30 basis points due to a faster rise in the Cost of funds. eased -0.27% to close at 18.40 and traded 1.600m shares. specifically cited Kenya as an Outperformer in the Portfolio. the Exchange in 2016. Buyers have swelled and volumes in 2016. BAT firmed +0.73% to close at 825.00 and traded 62,000 shares.